Portugal has breathtaking scenery. The volcanic islands of the Azores are situated on the mid-Atlantic ridge and benefit from the warmth of a passing gulf stream that gives it a moderate climate despite the northern location. This warmth also benefits the profusion of azaleas, ginger, and hydrangeas that grow wild around the islands. 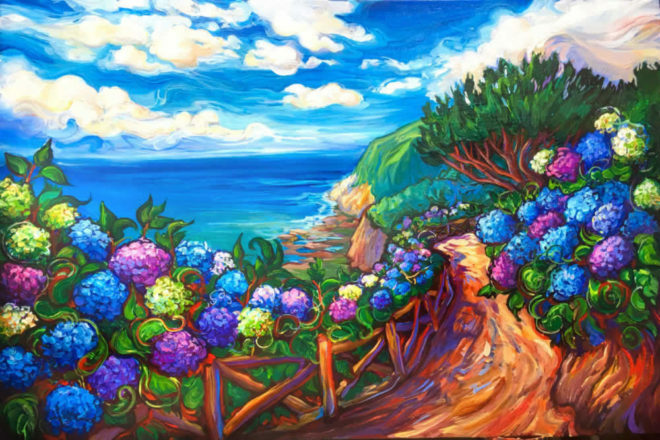 Hydrangeas, in particular, have become a symbolic flower in the Azores and make for colorful windbreaks along the many coastal trails. Do you have another one for sale? just hydrangeas available here: https://laurazee.com/portfolio/hydrangeas-ii/.